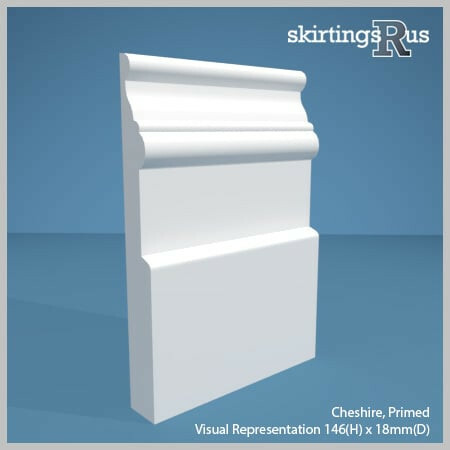 Cheshire skirting board is a newer addition to our range. This larger moulding suits designs which are using higher skirting boards, as the moulding will look more in proportion on the larger board. This design offers a larger area of moulded shape; therefore it will look great in rooms with high ceilings, using higher skirting board. 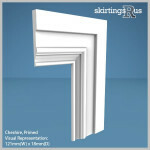 Cheshire does have a matching architrave, but it is a lot wider (121mm) than a standard architrave width, which should be considered before purchasing. -- Please Select --146mm/Ex 6" 171mm/Ex 7" 196mm/Ex8" 221mm/Ex9" 246mm/Ex 10" 271mm/Ex 11" 296mm/Ex 12" 146mm/Ex 6" 171mm/Ex 7" 196mm/Ex8" 221mm/Ex9" 246mm/Ex 10" 271mm/Ex 11" 146mm/Ex 6" 171mm/Ex 7" 196mm/Ex8" 221mm/Ex9" 246mm/Ex 10" 271mm/Ex 11" 296mm/Ex 12" 146mm/Ex 6" 171mm/Ex 7" 196mm/Ex8" 221mm/Ex9"
Our Cheshire skirting board is made of a high density, moisture resistant (MR) MDF. MDF is free from natural defects. This gives it a long product life and means that MDF will not; warp, twist, bow, split, or contain knots, all of which you would find in pine and any other natural wood. This makes MDF the most economical, time saving material for your skirting board requirements. Skirtings R Us MDF builds on these properties. We manufacturer on a High Density MDF board which we have specifically sourced, as it produces a far smoother cut surface when moulded, making a superior quality product compares to other standard or premium MDF skirting boards. 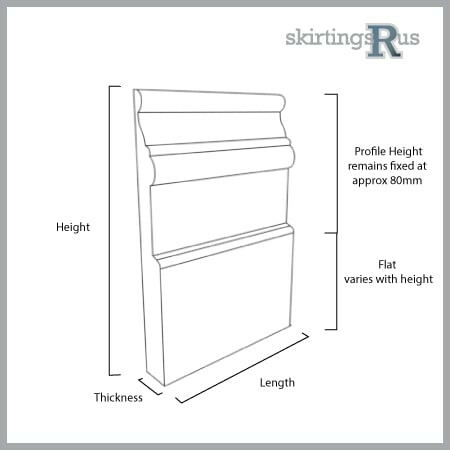 If you need any further help with dimensions please refer to our skirting board dimensions guide. 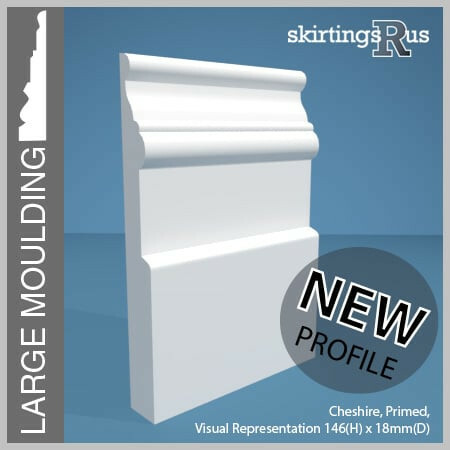 Cheshire MDF skirting board is available in a variety of set dimensions. We can also offer bespoke skirting board heights at no extra cost. Depth – Available in 18mm and 25mm thickneses. For more information see our skirting board dimensions guide. Un-primed – Product will be supplied as raw MDF skirting board, with no MDF primer applied. The product will need priming before any paint finish is applied. Cheshire skirting boards can have a space machined out of the back of the board, allowing cables to be run and hidden behind it. For more information and a guide on cable space, see our cable space information page. Our Cheshire MDF skirting board is produced in house in our midlands based factory and is machined to order from the specification options above. If you can’t see what you’re looking for, then you should know we can cut to any size and undertake bespoke requests. For more information visit our bespoke page or feel free to give us a call!